Community Forums • View topic - HOME FOR THE HOLIDAYS 2017! 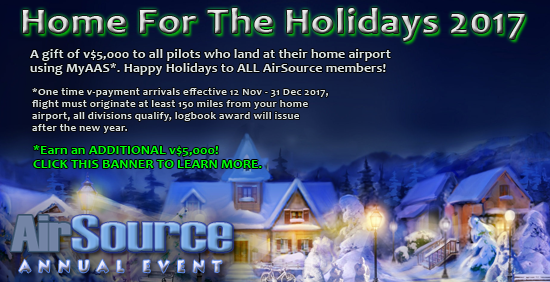 One time v-payment for arrivals to your HOME AIRPORT; effective 12 Nov - 31 Dec 2017, flight must originate at least 150 miles from your home airport (*LAST LEG OF FLIGHT must originate at least 150 miles from your home airport if performing the BONUS FLIGHTS), all divisions qualify, logbook award will issue after the new year. Only pilots hired BEFORE 12 Nov 2017 are eligible. DO NOT change your home airport after 11 Nov 2017! All pilot data will be "frozen" and downloaded as of 00:00 UTC 12 Nov 2017. The home airport you had at that time will be used to determine your eligibility for this event. [THIS IS NOT APPLICABLE NOW THAT THE EVENT HAS STARTED] You can add or change your home airport by going to PILOT OPERATIONS, then click on the AIRPORTS link (2nd row all the way to right), then SEARCH for your home airport. Once the airport page comes up, simply CLICK on the link on the top left portion of the airport data area (the link is called "Set as my Home Airport". That's it! But be sure to do add or change your home airport before Friday evening 19 November! Re: HOME FOR THE HOLIDAYS 2017! Not sure how you guys keep up with whos flown what flights? but mine have been completed already. Thanks Paul - glad you enjoy this event! The system tracks flights, and awards are distributed after the new year / event completed. It seems that the holiday season comes around faster each year. Maybe because I'm getting older or something. I look forward to the home for the holidays flights. Here are my flight plans for this year. Castlegar (CYCG) to Vancouver (CYVR) My home airport. Thanks for the series Tom. Finally managed to complete my home for the holidays flights after two system crashes & one aircraft install! Maybe I need to ask Santa for a new computer for Christmas. Once again, thanks Tom for this yearly GREAT event. All completed, I love this event!! Cool Greg! Please give us some suggestions so that you will enjoy flying more than just this event! Happy to hear that you like this one though, I do too and hope I get more time to get some flights in the next couple weeks. Thank You so much for getting me squared away with my log-in to the Forums! Hey Andre, I agree with you ?? ?I love this event!??? I guess the feeling in a virtual way that you can direct events in one?? ?s own self of gratification is very appealing. Not only in the Holidays Spirit but it is very appealing as a pilot for the AirSource Community. So, Thank You Tom and all the others that might have lent a helping hand. I appreciate it very much and I look forward to next years??? event of course! General Aviation Flight - KSAT to KIAH Home Airport, HOUSTON. Completley forgot all about this. DOH! All Home For The Holidays 2017 Awards have been distributed - wow what another great turnout!! Thanks to EVERYONE and Happy New Year!